Researchers today published the most detailed map of the ocean floor ever produced. Data collected by satellites and remote sensing instruments were used to created a model at least twice as accurate as previous maps, revealing thousands of previously uncharted seafloor features in the process. And best of all, you can explore the maps for yourself! Much of what we know about the ocean floor's topology we know from data collected by multibeam sonar systems. It is estimated that these sonar systems – which have to be lugged back and forth across the ocean's surface by ships in order to acquire soundings of the seafloor deep beneath them – have left a staggering 90% of the deep-sea bottom uncharted. 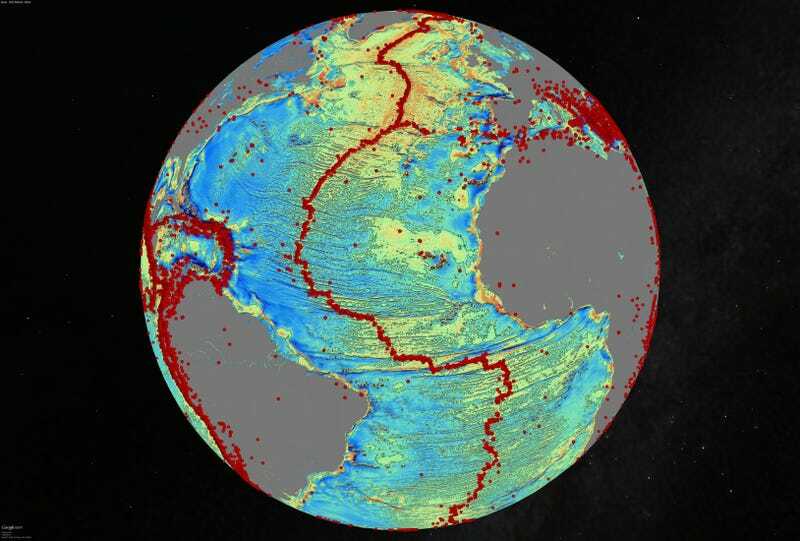 Now, researchers led by geophysicist David Sandwell, of Scripps Institution of Oceanography in San Diego, California, have used data collected from satellite-based radar altimeters to fill in huge swaths of missing seafloor. What's incredible is that these satellites map the ocean deep not by scanning the seafloor, but by repeatedly scanning the waters' surface. Correcting for waves and tides creates a picture of sea-surface topography that reflects features of the seafloor far below. "A seamount, for example, exerts a gravitational pull, and warps the sea surface outward," said Sandwell, in an interview with Science News, "so we can map the bottom of the ocean indirectly, using sea-surface topography." Among the new features they're now able to detect, Sandwell says, are thousands of previously unknown seamounts between 1000 and 2000 meters tall dotting the ocean floor. They also discovered an 800-kilometer-long now-extinct (i.e., no longer actively spreading) ridge in the South Atlantic Ocean that formed after Africa and North America rifted apart. The team also reports the exact location of a now-extinct seafloor spreading ridge, a zone where two tectonic plates began pulling apart 180 million years ago to form the deep basin that became the Gulf of Mexico. "That was a surprise to me—you'd think everyone would know everything about the Gulf because it's so well-studied," he says. "Of course, people knew it opened from seafloor spreading, but they didn't know exactly where the ridge and transform faults were." Those features were so deeply buried by sediment that the gravity signals were extremely faint.